We in Sri Lanka have a history to be proud of. According to our historical record, the golden age of Sri Lankan agriculture production centers around Polonnaruwa during reign of King Parakramabahu the Great (1153-1186 AD). At that time, Sri Lanka was known as the Granary of the East and the nation’s prosperity expanded substantially during this era - mainly owing to the epic scale of rice cultivation and reported exports. This flourishing peasant agricultural sector was later destroyed during different ancient regimes, and through the colonial invasions of the Portuguese (1505), Dutch (1658) and British (1796) thus shifting the country’s agriculture to a plantation-based model. In colonial and post-colonial Sri Lanka, we witnessed the shrinking of the country’s agriculture sector, where Sri Lanka went from being the Granary of the East to a nation that in the 1940s, was importing as much as 60% of our rice even from Myanmar to feed a population of just 6 million. At that time, we were proudly using traditional technologies, without any agro-chemicals and the average yield stood at approximately 0.65 tonnes per hectare. By 2015, our population had grown to 20.7 million people, yet we were able to increase productivity to 4.5 tonnes per hectare, representing an increase in total paddy production in the magnitude of 15.8 times compared to that of 1940. This was despite only marginal increases in extents of rice cultivation which expanded by only 1.85 times over the past 75 years, meaning that the bulk of this increased production was almost exclusively a result of new agricultural technologies. This massive improvement was made possible due to improved education, research, extension, and adoption of new technologies including agrochemicals (fertilizers and pesticides) together with the extension of health and education services. This is a classic example how we have continued to feed our nation, minimizing foreign exchange drain on import of the major staple, and surviving global food and food-price crisis experienced in the past. 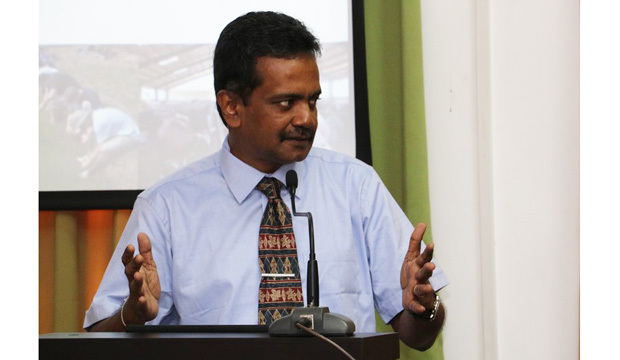 In the past two years (2016-2017), Sri Lanka’s agriculture sector was negatively affected, partly due to drastic climate change and partly as a result of policy changes made without scientific evidence. The impact of climate change has been discussed at length in previous articles written by the author. However, the recent policy changes made without any consideration of scientific evidence – including the removal of time-tested weed control tools due to their alleged involvement in chronic kidney disease of uncertain etiology (CKDu) - have exacerbated the negative impacts of climate change affecting both food and plantation crops. Given that weeding remains the most troublesome biological constraint to any crop production, it is evident that these types of short sighted policies cannot last much longer. Glyphosate was imported to Sri Lanka with the intervention of the Tea Research Institute (TRI) of Sri Lanka in 1977, with initial use being confined to experimental use on roadsides, ravines, boundaries and abandoned tea fields for the control of weeds such as torpedo grass (Panicum repens). A year later, in 1978, following evaluations on preliminary experimental use and following TRI recommendations, Sri Lanka started using the herbicide on such areas at a national scale and by 1983/84, the Mahaweli Development Authority of Sri Lanka was involved in experiments using the herbicide in zero tillage systems, which were later abandoned. Glyphosate was later recommended by TRI to be used in pruned tea fields and mature plucking fields (after three pruning cycles) to control troublesome weeds in 1988 after successfully completing the herbicide residue trials in tea, and for general weed control in tea in 1994. The Department of Agriculture (DOA) evaluated the herbicide for weed control during land preparation of rice in 1995 and recommended the herbicide for pre-plant weed control in rice in 1998. However, the herbicide did not initially attract paddy farmers due to availability of the low cost and quick-acting herbicide paraquat at that time. When paraquat was banned in 2014 through a phased out process following several incidents of suicide utilizing the herbicide, and expired patent rights by Monsanto® for their popular glyphosate-based herbicide, numerous second-makers flooded the international market with such herbicides at a cheaper cost. Consequently, glyphosate became popular among paddy and maize growers, in addition to those in tea plantations. According to CropLife-Sri Lanka, of the glyphosate imported in 2014, tea consumed 36%, maize and other field crops 33%, wet zone paddy 25.8%, and dry zone paddy 4.4%. Glyphosate was restricted for use in December 2014 in five main districts where paddy was cultivated in Sri Lanka. This decision was mainly based on a “hypothesis” paper published by a group of Sri Lankan scientists in February 2014 that first considered a hypothetical link between glyphosate and CKDu. The herbicide was banned from importation and use in June 2015. The impact of the absence of effective weed control technique in tea cultivation has been discussed and debated heavily. Recently, the Planters’ Association (PA) has estimated a loss of Rs 10-20 billion per year due to the ban of glyphosate mainly owing to increased cost of production arising out of high cost of labour intensive alternate weeding techniques or abandoning weed control in tea fields due to scarce and costly labour resources. It is our economy that has been threatened due to this unwise, non-scientific decision in banning glyphosate. The FAO of UN and World Food Programme (WFP) produced a Special Report on Food Security in Sri Lanka in June 2017 and stated that “Until recently, farmers relied heavily on the use of the herbicide glyphosate (‘Roundup’) to control weeds in their paddy fields. In 2014 a presidential decree banned its use in most agricultural sectors in the belief that it was responsible for the high incidence of chronic kidney disease amongst paddy farmers, especially in North Central, North Western, Uva and Eastern Provinces. In the absence of glyphosate, paddy fields often have a high weed population. In a year of reduced rainfall this is especially harmful as the weeds, which are often more adapted than the crop to dry conditions, use a large proportion of the available soil moisture.” It is clear that our national food security has also been challenged as a result of this ad hoc decision to ban a proven weed control technique. Increasing incidence of CKDu in dry zone of Sri Lanka has drawn the attention of many scientists and medical practitioners and researchers. Given that the causal factor of CKDu remain unknown, it has been dubbed as having a multi-factoral origin by medical professionals from Peradeniya and Kandy who with long years of experience of this disease in the country. There is no argument that the affected communities should be treated and no new incidence of the disease should emerge. At a recent press conference held on 22 March 2018 organized by the National Research Council (NRC) to commemorate the World Water Day, the scientists including a well-respected Nephrologist has made it clear that there is no conclusive evidence to say that pesticides are linked with the disease. Moreover, the WHO’s International Expert Consultation on CKDu held in Colombo in April 2016 - where the author of this article was also invited as an agronomist - reported that there is no conclusive evidence to implicate glyphosate and other agrochemicals as a cause for the disease. CKDu was first recorded in early 1990s in the North Central Province, where paddy cultivation is dominant. However, the herbicide glyphosate was recommended to be used in paddy fields only in 1998. Therefore, associations explained by some researchers between glyphosate and CKDu stand out as being highly questionable. Deviating away from the hypothetical links of the herbicide to CKDu, some scientists claim that the herbicide ban should be continued as it is categorized as a probable carcinogen (class 2A) by the WHO since March 2015. This was based on the recommendation of the French-based organization called International Association for Research on Cancer (IARC). This highly debated and controversial categorization has been challenged by many countries and organizations. There were even claims for conflicts of interest of those involved in decision-making. Considering these results and other studies conducted by independent research groups, the EU voted in November 2017 to renew the license of glyphosate for another five years with 18 countries supporting, nine opposing, and one abstaining. This is despite the fact that many anti-glyphosate lobbies have been waiting impatiently to see the product banned. Moreover, among the nine countries voted against, four have opposed as they wanted the glyphosate license renewal for a period less than five years. Essentially, 22 out of 28 countries in the EU wanted the herbicide at least in the short run. The EU with strong regulatory measures and human toxicological and environmental concerns still gave the green light to use the herbicide to ensure their agriculture progresses and the continued food security of member nations. In contrast, Sri Lanka – without any reliance on even a fraction of scientific data available - has banned a time-tested product without even pausing to propose an effective alternative. Instead, based on a hypothetical argument, we have compromised our food security and national economy. It is high time that we reverse the decision taken. Instead of banning the product government should have promoted using it judiciously, wisely, and in accordance with recommended dosages, application techniques, and timing. We need effective alternatives for herbicides and we have been using alternate techniques where possible. Flooding lowland paddy fields is considered as an effective age-old technique to control weeds, by reducing their competition with the crop and negative impact on crop yield. However, lack of adequate water in a changing climate still causes problems to the farming community. Manual weeding or use simple implements such as mammoties and grass cutters are alternatives, provided that the economic benefits are assured. The situation is different with respect to other crops, for example: maize and tea. Both being up-land crops and grown in different terrains with no options for water logging (the upland crops are sensitive to stagnant water) more labour intensive technologies are the only option thus, affecting the economic returns from crop cultivation. Mulching may work out to be a viable option to control weeds provided that large quantities of the materials are made available. Overall, practical application of available alternatives has not yielded the expected results, except for some locations including small scale agriculture. Scientists are still working out, and need time, to come up with viable alternatives that provide effective weed control, minimized non-target effects and required economic gains. We have failed to look at issues taking the totality into consideration. The complex problems in agriculture have no single and simple answers, especially with regard to national level food security. Forces with political and spiritual ideologies have always succeeded in the recent past in over-ruling even the most basic scientific principles. This is a pathetic story. We have to analyze our production systems in concert with our food security in order to ensure that our growing population will be fed overcoming hunger, without depending on food supplies from neighboring countries. Food security is a National Security issue that cannot be ignored. Hence, any policy that negatively affects national food security should never be tolerated as it will without a doubt lead Sri Lanka into becoming a food beggar nation. Our policy makers must follow science and make evidence-based decisions considering the big-picture rather than focusing on one-end of the problem. Scientists, too, need to support the policy makers by being open and providing conclusive and scientifically valid data to facilitate decision making. However, they have to be careful not to bombard decision makers with half-baked information or information based on whims and fancies of a select few, especially where the outcome is potentially disastrous. Our country has already experienced the negative impacts of the latter. Misinformation is worse than not providing any information at all to the public and policy makers. Unfortunately, many seek to grow influence by stoking unnecessary and oftentimes irrational fear among the general public on incidents/substances without any scientific evidence. This has now become a common method to rally people to achieve unscrupulous political or personal motives, and I believe our most pressing concern is now to ensure that such tactics are dispensed with. Science and rationality must prevail. The ban on glyphosate has been imposed without scientific evidence. The recent claim that we need to go by the precautionary principle itself proves that the original decision to ban the product made in 2014/2015 hypothesizing that the chemical causes CKDu is baseless. Three years have lapsed since this erroneous decision was made and in that time, the agriculture sector has taken the brunt of this disastrous policy. Climate change further exacerbates these dynamics. Weeds tend to thrive and compete vigorously with crops when resources are limited. That is their nature. We need to understand this behavior to make sure the crops survive and the country reap richer harvests. Regular challenges continue to be made to those who support the ban to clearly state their justification with scientific evidence and to date, none have stepped forward. Hence, there is no necessity for new reasons. Interestingly, many who supported the ban also claim publicly that glyphosate-based products are imported illegally and are available freely in the country. This is yet another reason for lifting the ban. Previously, we have been bringing in pesticides under stringent government control through the Registrar of Pesticides (ROP) who operates as per the Pesticides Control Act No 33 (as amended) of 1980. We have now blocked the entry of quality-assured glyphosate to the country but opened up avenues to crooked businessmen to bring in products illegally with no quality control. Just a few days ago, Sri Lanka Customs reportedly confiscated an illegal consignment of glyphosate. This seems to be the third occasion, but who is responsible for such imports? Who uses these illegal products? They are the same cohort that some others assume to have been affected due to the use of the herbicide. Does this make sense? On one hand, those who forced the policy makers to impose the ban without scientific evidence should take the responsibility for this unfortunate situation. On the other hand, was it a deliberate effort to provide business/political opportunity for a select few? We must now ask who stands to benefit, since clearly it is not the agriculture sector.